Red State Blue Collar: United We Stand. Sure thing. United We Stand. Sure thing. I know this won't be a very popular attitude but to tell the truth, I'm a little sick of the way we wallow in 911 every year. Of course, I believe in honoring the courage and dedication we saw on that day and many days after but, honestly I think we took all the wrong lessons from the tragedy of 911. 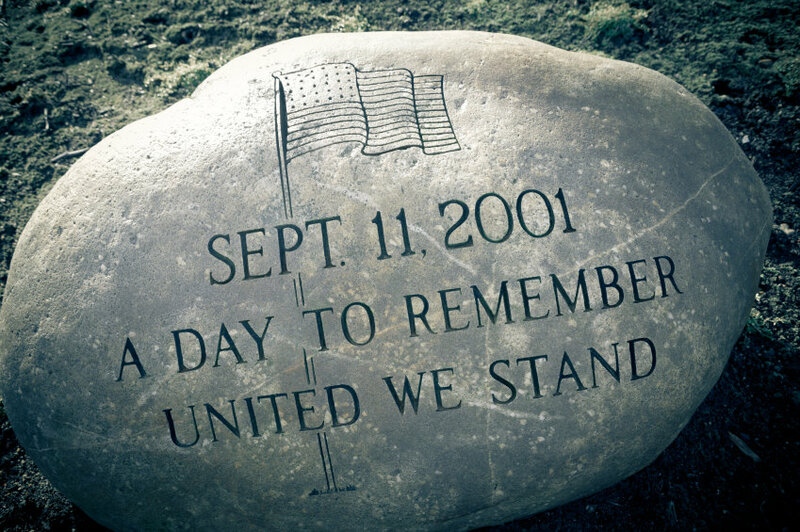 What is carved on this rock is all that needs to be remembered - United We Stand. That didn't last very long, did it? We hate each other more than we ever did before. I have said practically from the beginning that 911 turned us into a nation of cowards. Yes, Al Qaida pulled off a coup because we weren't expecting it but it wasn't one they'd be likely to be able to repeat. We canceled our vacations and ran around looking for duct tape and our deputies here in my county were hired by to stand guard over our water system....in Wabash, Indiana! Yeah, I bet the terrorists had their plans all made to strike Wabash. We went to war in Afghanistan and stayed even after we knew Bin Laden wasn't there and even after we knew Bin Laden was dead and 16 years later we are still there with no end in sight. We went to war in Iraq for no good reason that anyone but the Bush administration could ever explain. We were killed by the thousands and we killed many more thousands and there we still are. We created an expensive and secretive new agency, the Department of Homeland Security, that can listen to our phone calls and read our e-mails and God knows what else. That agency sent us in Wabash semi-loads of hazmat suits and gloves and masks. They probably eventually went in the landfill. God knows, we never used them. We upgraded Guantanamo 'cause, you know, we were too frightened to even have the terrorists in prison on our shores. Ooh, that was too scary. And there Gitmo still sits today, still being used although their record of military tribunals has been much less successful than civil courts as far as meting out punishment. We tortured and engaged in extreme rendition. We call ourselves exceptional but Abu Ghraib will forever be a blot on our reputation for exceptionalism. We abandoned everything we once stood for out of fear. "We doan need no steenken' principles." Acts that were against international law that we huffed and puffed about when other countries performed them were suddenly not so bad because it was us, the United States, that had been attacked! I think 911 led the way to a Trump presidency with his lies about seeing Muslims in New Jersey celebrating the towers coming down. And his paranoia about immigrants and his Muslim ban. His division of Americans into tribal groups. Look at Muslims with suspicion. They are probably terrorists. Look at Mexicans with suspicion. They are probably rapists. Look at African-Americans with suspicion. They are probably thugs. He even thought that one underhanded Black man sneaked in from Africa to become our president. We forgot the most important thing we should have learned in 911 - United We Stand - and remembered all the things we should have forgot.